A funny and enjoyable cops in high school movie. A very entertaining movie due mostly to its smart brand of humor. 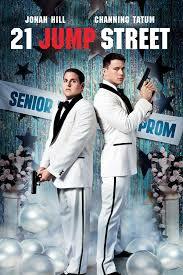 the story is simply about two guys posing as highschool kids while they are really undercover cops. That much is routine. But the way the movie finds comedy in the smallest things is what makes it really work. Look at their commentary on usual movie car chase explosions or on doves coming out of a car. the action might not be anything special, but the humor more than makes up for it. we have much more fun, for example, at a scene of Jonah Hill and channing Tatum hanging in the air from strings during a performance of Peter Pan, than we do in a usual car chase or hotel room shootout. this movie has it all, including lots of great cameos and perfect casting. Just look at the two different police captain roles (Nick Offerman and Ice Cube.) the story, which starts out routine, finds clever ways to get both the cool kids and also the science – technology nerds involved. he plot and action aren’t always great, but the humor certainly is. 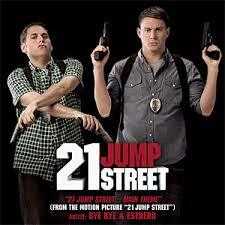 21 jump street is the latest movie to come from the judd apatow gang of comedy. what that means is that it stars and was written by one of Apatow’s actors. Jonah Hill. it is the third movie I’ve seen in about two weeks that can make that claim, after seeing Seth Rogen in 50 / 50 and Jason Segal in Bad Teacher. While segal didn’t write Bad Teacher, he did write Forgetting Sarah Marshall, his breakout movie. and rogen wrote 50 / 50 as well as other films like superbad. the thing that’s so amazing about these apatow actors is that they are not only incredibly funny movie stars, but they are also ambitious and smart writers. jonah hill might not have written the screenplay for 21 Jump Street, but he wrote the story and the outline of ideas, before passing it off to a screenwriter to flesh it all out. and the movie works. like those other films which starred apatow actors, these guys know what kind of dialogue they can pull off and make funny. they know what sounds funny and they know how to deliver it. hill is hilarious here, as is his partner in crime, channing tatum, who i am starting to like more and more these days. the movie is about these two guys who went into the police academy, thought they were gonna do all the cool action, cops-and-robbers stuff, and ended up patrolling parks, dealing with little kids feeding ducks. there is a very funny scene early on where they have to deal with exactly that as a little kid defies schmidt (jonah hill), and pushes him to the edge over dropping bread crumbs into a pond. hill just came off the movie the sitter, in which he was pushed around by kids the whole time, and he knows how to handle this material, talking to them harshly as if they are adults. that’s what i mean by these actors knowing what works for them. they know what situations they are funny in, and so they write those situations for themselves. after screwing up a drug bust because tatem’s character, jenko, doesn’t know the miranda rights, the two of them are sent to a small police unit which meets in an old korean church with the address, 21 jump street. there are funny moments leading up to this, including a meeting with police captain nick offerman, of tv’s parks and recreation. but once they arrive at the korean church and meet their stereotype embracing, tough talking captain, ice cube, the real story begins. cube employs a unit of young cops in their twenties to go undercover as highschool students and bust up drug rings. he sends these two guys in as brothers. they move into schmidt’s house, with his parents, and even that is funny as the parents have a wall of pictures of him that is more like a shrine. there’s a photo that looks like it’s out of the wonder years, and shmidt makes a lot of jokes about this photo and the conditions when it was taken. the movie opened with the two guys in highschool, back when they were students, and the main reason for that was to show us how jenko was a cool jock and schmidt was a nerdy loser. now, when they arrive at school, they realize pretty quickly that things are different. the cool kids aren’t the athletes and the tough guys anymore, but the sensitive, environmentally-aware guys. schmidt has a great conversation with jenko where he explains all of this and how much things have changed. i like that this movie is refelective of the times like that and isn’t afraid to point these things out. most movies about highschool would be relying on the old saved by the bell cliches, of the jocks and the nerds. this one tries to put itself into modern times and does a hell of a job. the best friend of the most popular kid in school is a weak black kid, and jenko makes himself look like an insensitive loser on the first day for bearing this kid up. the storyline has the characters be so dumb that they don’t know their identities and mix them up so that jenko, the athlete, is the one going to chemistry class, and schmidt is the one doing drama club and running around on the track. this makes for some humorous interactions. especially with jenko, who gets in with the nerds and learns to embrace their culture (lines about general zod from superman II and fake light-saber battles.) all of this is meant to get them in with the cool drug dealing kids. and it works. schmidt in particular finds an in with them and gets involved in the dealing himself. jenko, meanwhile, has the nerdy kids help him use technology to put a bug in the popular kids’ phones. and it leads up to both of them embracing their characters so much that schmidt finds himself playing peter pan, hanging from strings on stage in the school play, while jenko finds himself wearing an atom outfit, chasing schmidt out onto the stage. this is just one of many very funny moments. another one is when the two boys try taking the drug and hallucinate as they are talking to gym teacher rob riggle. they start imagining his face as all sorts of things, one funnier than the next. and how absolutely ridiculous these ideas are is what makes them so funny. another great scene involves a car chase where multiple tankers end up getting shot and leaking and the result is very surprising. again, it’s funny because it is so ridiculous that this would keep happening. the movie is not only funny, but also smart. i love all the social commentary about how times have changed and now sensitive, comic-book loving kids are cool. our boys blame the tv show glee for all of that. aside from everything else, there are great actors in supporting roles. elle kemper from the office, jake johnson from the new girl, and dave franco (james franco’s brother.) but more importantly than anything else, the writing is good. the movie isn’t afraid to make fun of itself, like how it has the characters have a discussion about doves coming out of their limo as they step out and then we see how that really happens and get a great reason for why. by the end of the movie, we might be more interested in the cameos than the action, but the movie embraces that too, making the cameos meaningful. this is a very good movie filled with lots of funny and smart moments.